CAMBRIDGE, Mass. 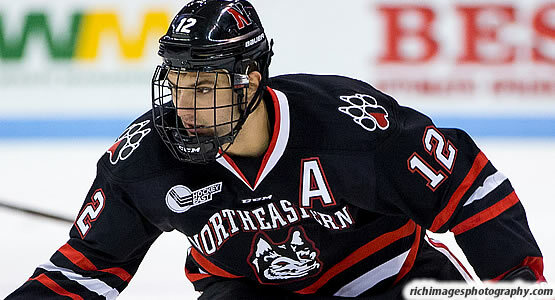 - The Hockey East Association announced tonight that Northeastern senior forward Zach Aston- Reese (Staten Island, N.Y.) has been awarded the honor of 2017 Hockey East Player of the Year. The award was presented as part of the 33rd Annual Hockey East championship awards banquet at the Royal Sonesta Hotel. 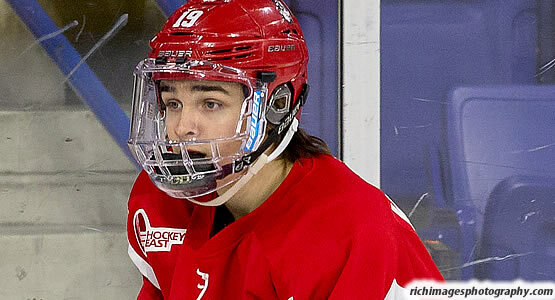 Alongside Aston-Reese, Boston University first-year forward Clayton Keller (Swansea, Ill.), was named the Pro Ambitions Rookie of the Year for a season in which he led the Terriers in scoring, and UMass Lowell head coach Norm Bazin collected his third Bob Kullen Award as the Bauer Coach of the Year after guiding his River Hawks to a share of the Hockey East regular season crown and the top seed in the Hockey East Tournament. Aston-Reese tops off a historic 2016-17 season by becoming just the second Northeastern player to be named the Hockey East Player of the Year and the first Husky skater to earn the honor. The Staten Island, New York native racked up 63 points (31 goals, 32 assists) in just 38 games across his senior campaign to lead the nation in points and registered 17 goals and 18 assists in 22 Hockey East games to finish second in the Hockey East scoring race. Aston-Reese led the NCAA in overall goals (31), goals per game (0.82), shorthanded goals (4), and hat tricks (3). The recent Pittsburgh Penguins-signee was twice named the Hockey East Player of the Month (November and February) and was also honored as the Hockey Commissioners' Association National Player of the Month, and Hockey East Player of the Week on three occasions. The 2017 Hockey East Player of the Year, Aston-Reese was named a Hobey Baker Top 10 Finalist on March 15 and is a semifinalist for the Walter Brown Award, given annual to the top American-born player in New England. Keller, despite missing eight games during the regular season, currently leads all Hockey East rookies in several offensive categories, including points (40), goals per game (0.68), assists per game (0.75), points per game (1.43), shorthanded goals (4), shots on goal (127), and shots on goal per game (4.54). The Swansea, Illinois natives 40 points, 0.68 goals per game, 1.43 points per game, four shorthanded goals, 127 shots on goal and 4.54 shots per game also lead all first-year players across the country. In regular season Hockey East play, Keller finished sixth in total scoring with 27 points in just 18 games played, but still led all skaters in shots on goal per game, firing five pucks on net per contest. Among his classmates in Hockey East, Keller led nearly every offensive category with 12 goals, 15 assists, 27 points, 0.67 goals per game, 0.83 assists per game, 1.50 points per game, two shorthanded goals, a plus-11 rating, and 90 shots on goal. He led his Terriers team in scoring while helping them earn a share of the Hockey East regular season title and was named Pro Ambitions Rookie of the Month in each of the last three months of the season. Keller was also honored as the HCA National Rookie of the Month in January, as he was in the midst of a 15-game point streak, and finished the year with at least one point in 25 of his 28 games played. Bazin returns his River Hawks to the Hockey East semifinals for the fifth straight year, just the ninth time a program has put together such a stretch. He coached UMass Lowell to a 14-7-1 record in Hockey East play, good enough for a share of the regular season title and the top seed in the Hockey East Tournament. He led the highest-scoring league offense (3.45 GPG) and the second-best defense in the conference (2.14 GPG). Under his direction, the River Hawks operated the most efficient penalty killing unit in the league, allowing just 11 power-play goals in 93 kills, good for an 88.2% success rate, and the third-best power-play efficiency (27.5%). Bazin coached four of the top-15 goal scorers in league play, the top-scoring defenseman, and had a rookie netminder with the fourth-best goals against average in league play.